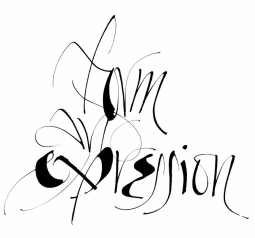 This exhibition traces the collaboration between calligrapher/book artist Thomas Ingmire and the Anglo-Welsh poet David Annwn as they explore processes through which they create works in response to the texts and images of the other. As Bruce Nixon has written “Their collaboration, which began in the early 2000s, is based on ekphrasis, a rhetorical device from antiquity, in which one art medium is described by another, thus heightening its affect for viewers or readers. In this case, the poet sends a poem to the calligrapher, who answers it with an image, which is then returned to the poet to become the basis of another poem, and so on, back and forth, an evolutionary process which, from the calligrapher’s perspective, yields a dynamic exchange, provoking the visualization of the written word well beyond the safety of individual style. As a collaborative undertaking, it is at once conversational and deeply personal.” Over the last ten years, David and Thomas have collaborated on twelve one-of-kind books, innovative calligraphic and poetry experiments, and several printed books. Most of these works will be on display for this exhibition.